Kelly Lehr The Ball Kickers won the Boulder City Parks and Recreation Department's adult coed kickball league Sunday. Members include, from left, Zach Trone, Sebastian Jimenez, D.J. Reese, Dain Szafranski, Vinny Mayo, Ryann Reese, Jerra Hinson, Jami Goudy and Tonja Toumasis. Kelly Lehr Members of Boy Scout Pack 30, Troop 7, conducted a flag ceremony March 14 to open the Boulder City Parks and Recreation Department's youth floor hockey league for third-sixth-graders. 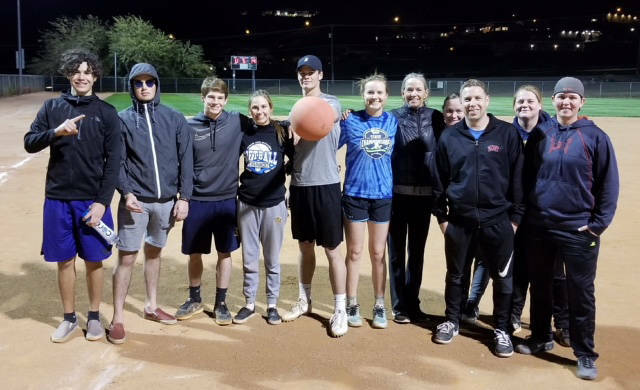 Boulder City Parks and Recreation Department’s coed adult kickball league concluded Sunday with the Ball Kickers being crowned champion. The tournament began with the semifinals at 6 p.m. with the Ball Kickers defeating The Chamber, and Thunder Cankles defeating Pitches be Crazy. In the title match at 7, the Ball Kickers shut out Thunder Cankles 14-0, said Kelly Lehr, sports coordinator. She said members of Parks and Recreation Department’s sports staff, Boulder City Police Department, municipal court and the fitness center came together during the past month for the fun tournament on Sundays at Hemenway Valley Park’s ballfields. Members of the championship team are Jami Goudy, Jana Goudy, AJ Greene, Kelly Greene, Jerra Hinson, Mary Hinson, Scott Hinson, Sebastian Jimenez, Kelly Lehr, Vinny Mayo, Marleena Mills, D.J. Reese, Ryann Reese, Dain Szafranski, Tonja Toumasis and Zach Trone. The next adult sport on the slate for Parks and Recreation is softball, with leagues for men’s and coed play. A meeting for team managers will be held at 7 tonight, March 22, at the department’s office, 900 Arizona St. Games will be played on Thursday and Sunday evenings through July. Boulder City Parks and Recreation Department’s floor hockey league for third- through sixth-graders began March 14 after an opening ceremony in the recreation center’s old gymnasium. 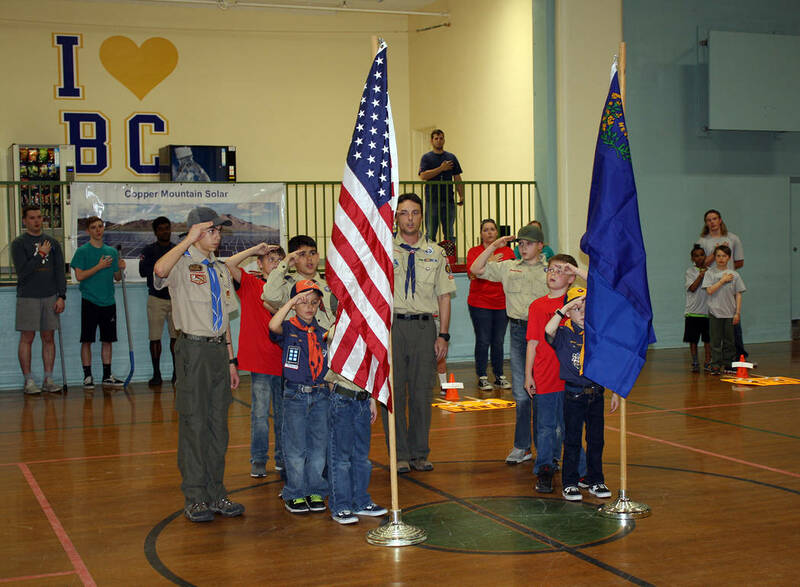 A flag ceremony led by members of Boy Scout Pack 30, Troop 7, began the evening’s festivities, followed by recognition of the 2018 sponsor of the league, Copper Mountain Solar, said Lehr. Four of the league’s five teams began play immediately afterward. Games will be played Mondays and Wednesdays through April.